DESCRIPTION You will love sitting on this Oversized Front Porch during the summer watching the sunsets. This great home sits on a CORNER LOT and has a HUGE Backyard. This Charming Home has an Open Concept Floorplan making it spacious and great for entertaining. Large Windows bring in Lots of Natural Light. The Living Room features a Built-in Wall Unit with a Fireplace and areas to showcase your favourite treasures. The Kitchen and Dining Room also have Large Windows overlooking the Backyard. Hardwood Flooring throughout Main Floor. The Upper Level has a Large Master Bedroom with Walk-in Closet, 2 additional Bedrooms and a Spacious Bathroom with Oversized Corner Tub and a Separate Shower Stall. The Lower Level is well laid out and ready for future development. This home has a Double Detached Garage and Huge Backyard. This home is located on a low traffic street. Tons of Extra Parking. Close to K-8 School and Playgrounds. Come and make us an offer! Home for sale at 106 Reunion Co Nw Airdrie, Alberts T4B 0G9. 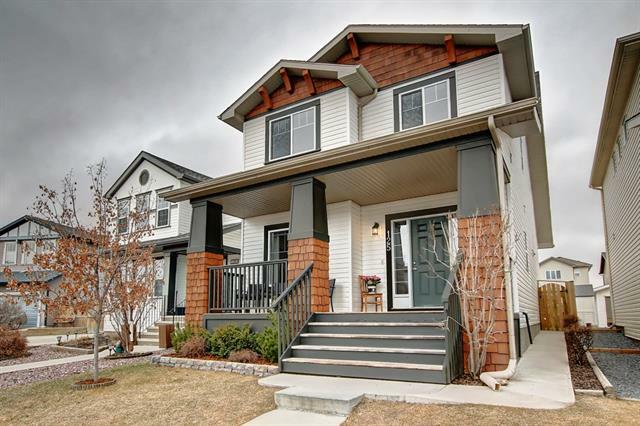 Description: The home at 106 Reunion Co Nw Airdrie, Alberta T4B 0G9 with the MLS® Number C4237911 is currently listed at $375,000.